World Borders: How to get from Turkey to Iran. 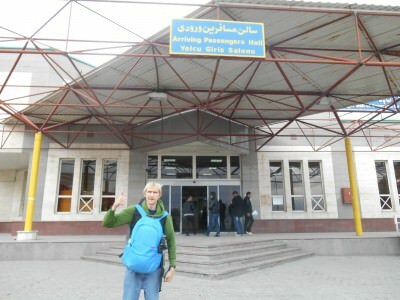 As far as world borders go, this one from Iran to Turkey overland is one of the fastest and easiest believe it or not. In fact, I was a bit surprised by the simplicity of it. 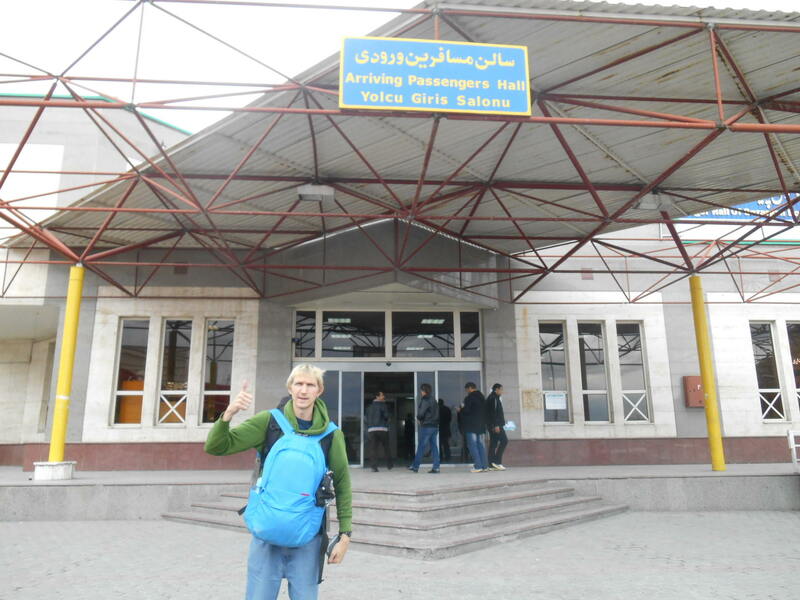 If you’re heading overland from Gurbulak to Bazargan, here’s a guide on how to get from Turkey to Iran. 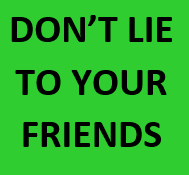 Don’t forget you might need an Authorisation Code for Iran and for sure a Visa for Iran first though (check my links). The Turkish town of Dogubayazit. Most travellers heading to Iran overland will either be based in, or pass through Dogubayazit. If you have time on your hands, it’s worth spending a night here. Cheap food, a load of hotels, an off the beaten track spot and an awesome hillside palace. I wrote about my visit to Ishak Pasha Palace. 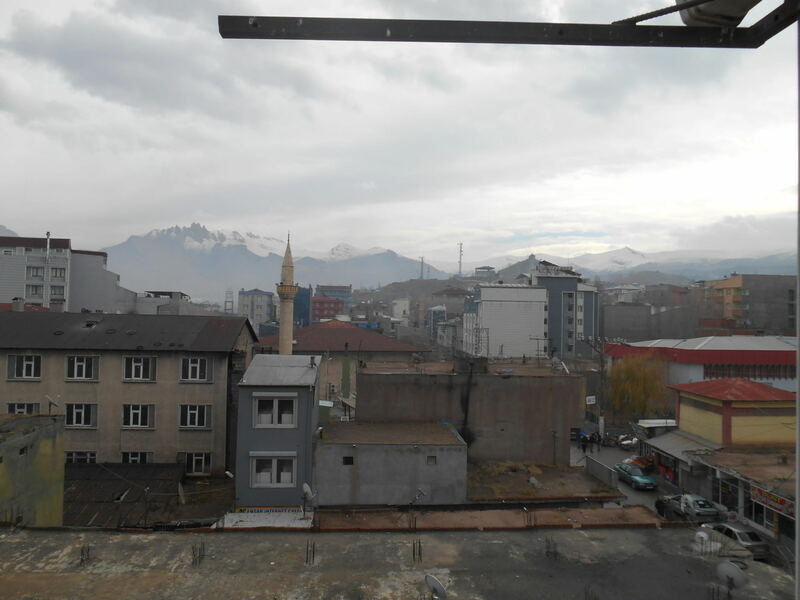 We spent a night in Dogubayazit then got up early doors to head to Iran. 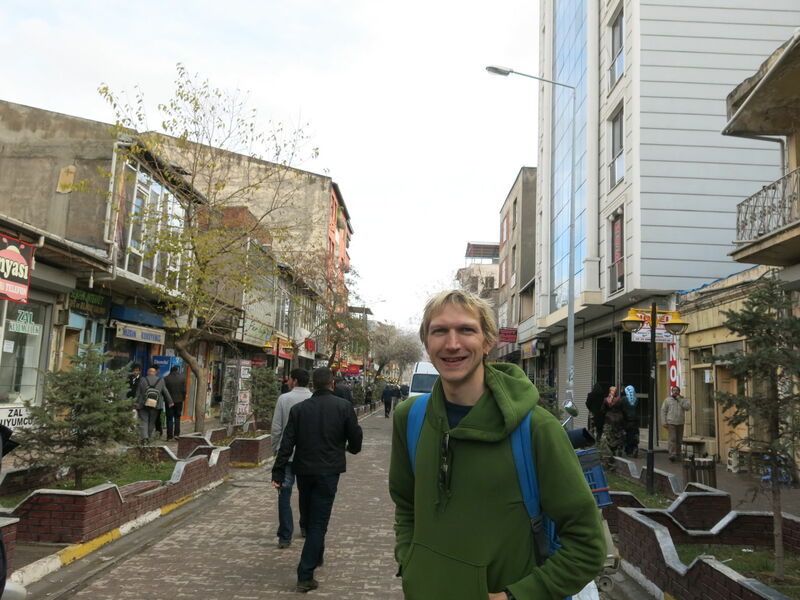 Downtown Dogubayazit – we stayed a night here on route to Iran. In downtown Dogubayazit, head to the corner where Agri Cadessi meets Rifki Baskaya Caddesi. 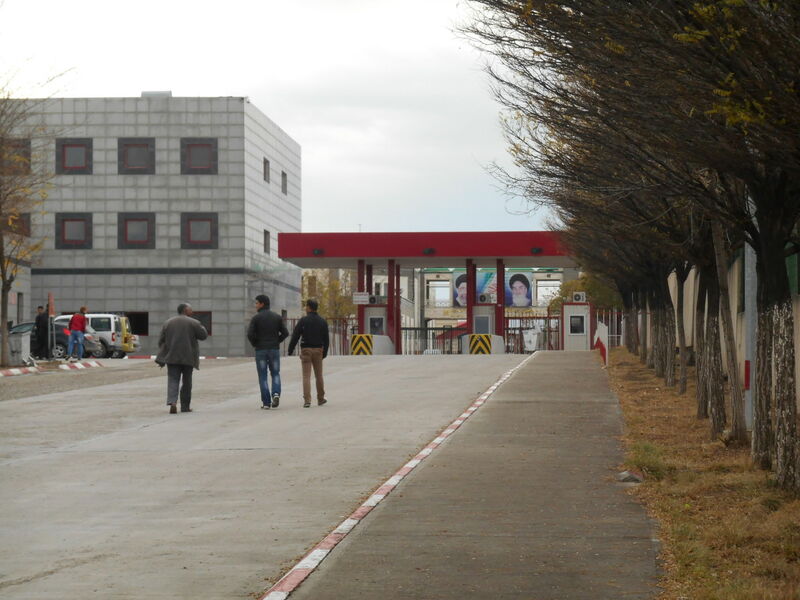 There’s a massive mini-bus depot there and opposite that a petrol station, then opposite the petrol station on the main road to Iran (Agri Cadessi) there’s a small office which advertises mini-buses to Gurbulak. The mini-buses leave when they’re full, or when the driver wants. Boarding the mini bus in Dogubayazit heading to Gurbulak. In November 2013 we paid 7 Turkish Lira per person for the ride. 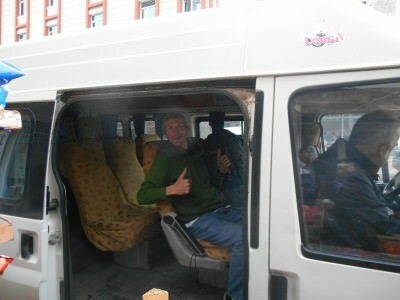 We were the only foreigners on our mini-bus. The ride took around half an hour only. On the bus from Dogubayazit to Gurbulak at the Turkey to Iran border. 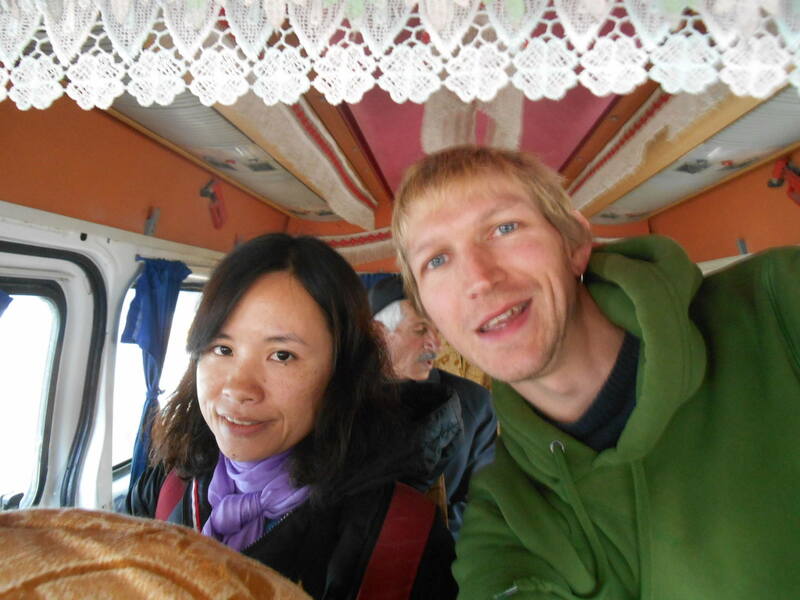 Panny and I on the bus from Dogubayazit to Gurbulak at the Turkey to Iran border. 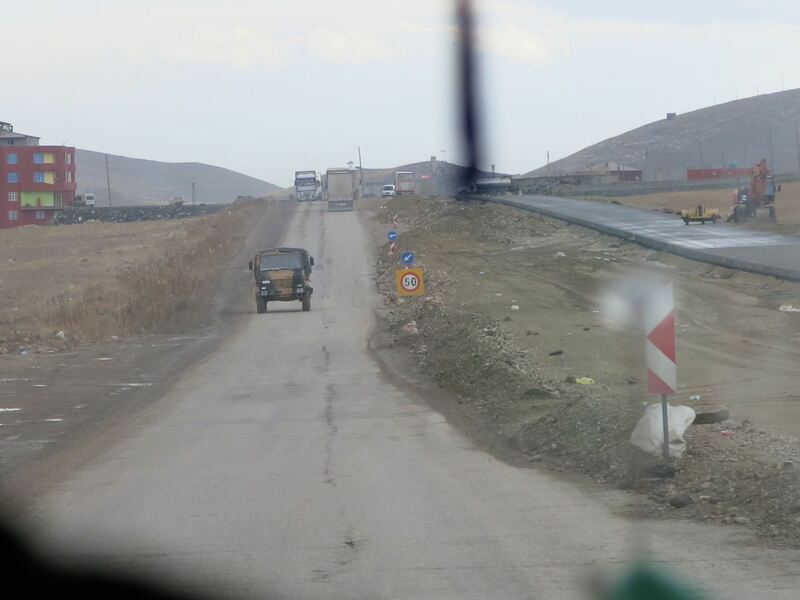 Pretty scenic on route, a few scattered old ruins, a few army trucks and we arrived at Gurbulak. It’s 35 kilometres from Dogubayazit to Gurbulak. You pay for the mini-bus when you get off at the border. The road from Dogubayazit to Gurbulak in Turkey, on route to Iran. This is easy and straight forward. Once you get off the mini-bus you see the border in front of you. The entrance gate is the same for vehicles and pedestrians, so just walk on through. There’s a load of Turkish flags above the entrance. They don’t check your passport at the entrance gate. There may be Turkish guys that follow you asking if you want to change money. Politely ignore them and keep walking toward the border. 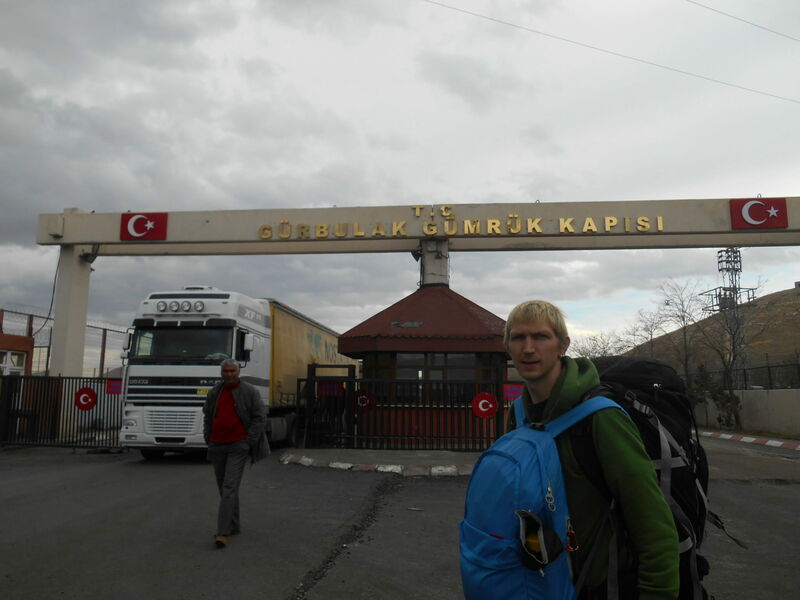 At Gurbulak ready to leave Turkey. The left hand side is for Heavy Goods Vehicles and Juggernauts, the right hand side is for the pedestrians so stay right. After a few hundred metres you’ll see the border in front of you. 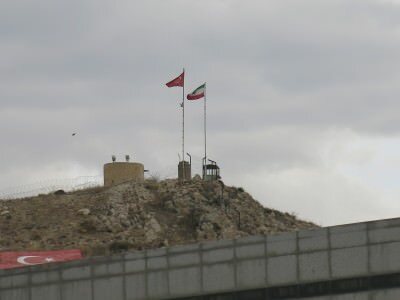 The Turkey and Iran flags at the Gurbulak to Bazargan border. Turkish flags fly and in behind is a large Iran flag and two photos of Iranians. On the left is the duty free shop. This is where you go to get your Turkey exit stamp. The Turkey side looking into Iran from Gurbulak to Bazargan. You walk in, up to the turnstile and hand your passport in to the guy behind the window. He’ll check your Turkish visa and Iran visa and that’s it. He will then stamp you out of Turkey. You’ve now left Turkey. There was no queue when we went and the entire process was over in a few minutes. 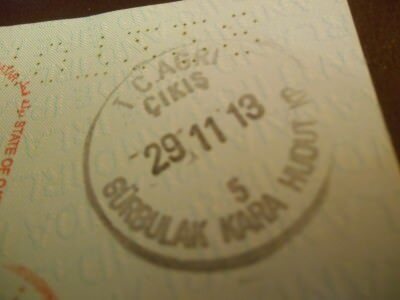 My stamp for leaving Turkey at Gurbulak. Then you pass the Duty Free Shop on your right, which was a tad baffling to see, as alcohol is forbidden in Iran, so realistically they won’t sell much booze here, perhaps it’s used by people coming the other way. The Turkey border exit point at Gurbulak. 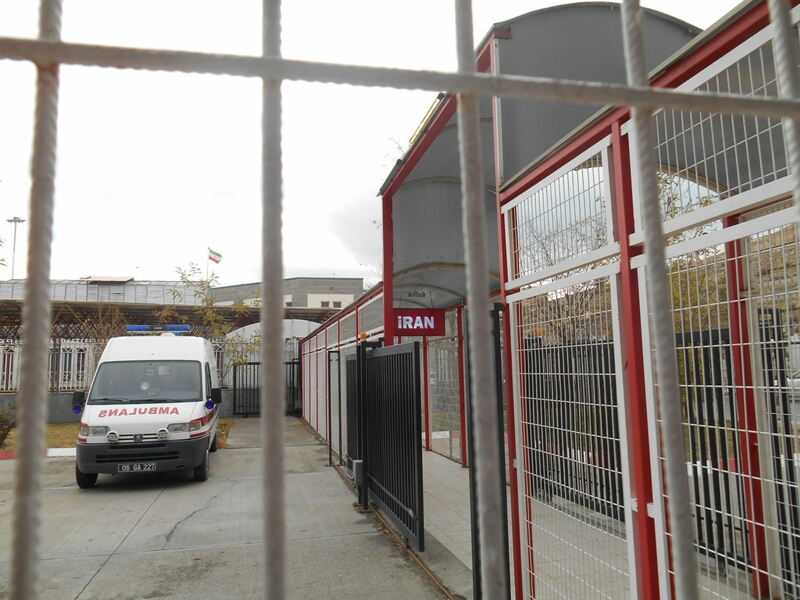 After that you head outside where you see a fenced pathway which leads to Iran. The fenced pathway that leads to Iran. Head along the fenced pathway and there’s a sign for Iran, It’s literally only 20 metres to the Iran hut. 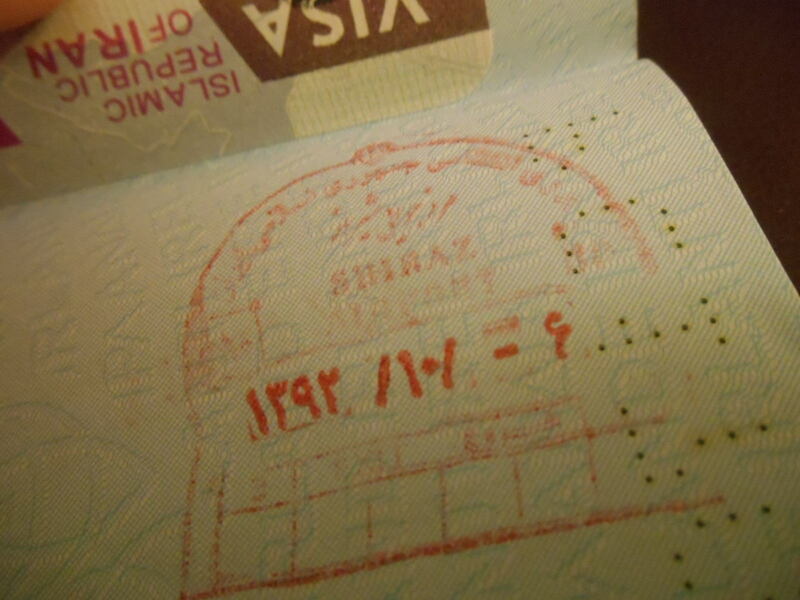 At the entrance to the building, a guy will simply check your Turkish exit stamp on your passport. He didn’t even look at the Iran Visa page. My stamp for entering Iran at Bazargan. 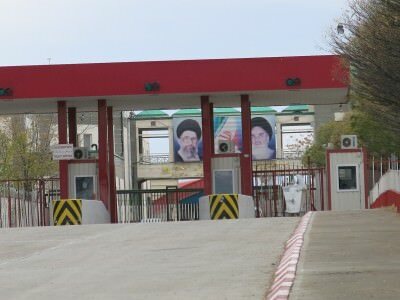 Then you come to the immigration section and entry to Iran. 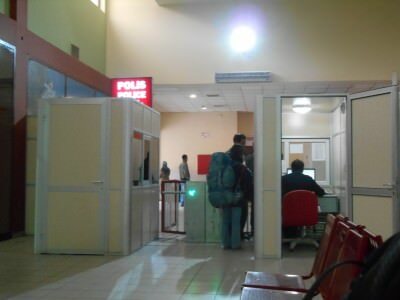 The guy working there will check your visa, ask you a few questions and stamp you in. This was ridiculously fast, friendly and efficient. His colleague came over and asked me what I work at, what parts of Iran we want to see (I said Tabriz, Shiraz, Isfahan and Tehran) and how we plan to leave (we said we are not sure yet – probably overland to Turkey). Successful arrival into Iran at Bazargan. After that, he led me through the entrance and I was in Iran. No bag check, no forms to fill out. All hassle free and friendly. 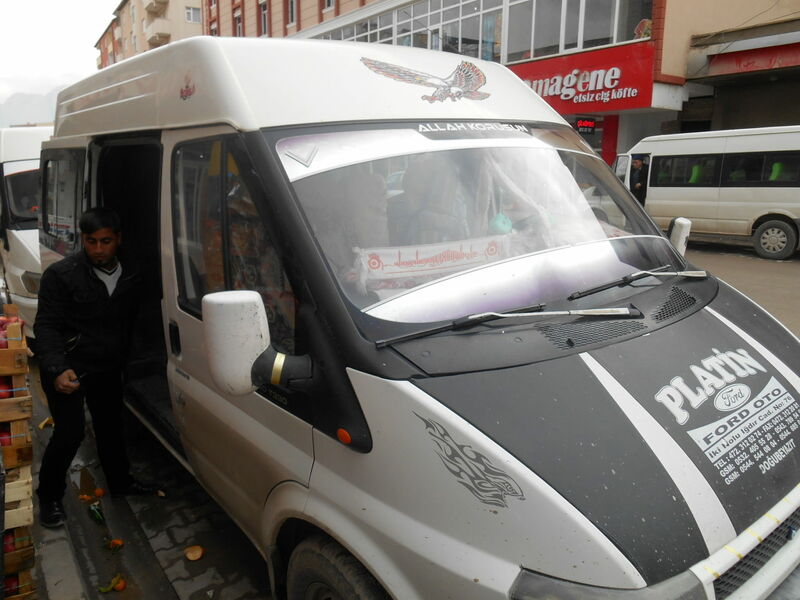 We got the minibus from the border point to the centre of Bazargan. We got a mini-bus which we ended up not paying for as the kind Iranians on board paid for us! I don’t recommend getting a taxi from the border as they will try to rip you off. 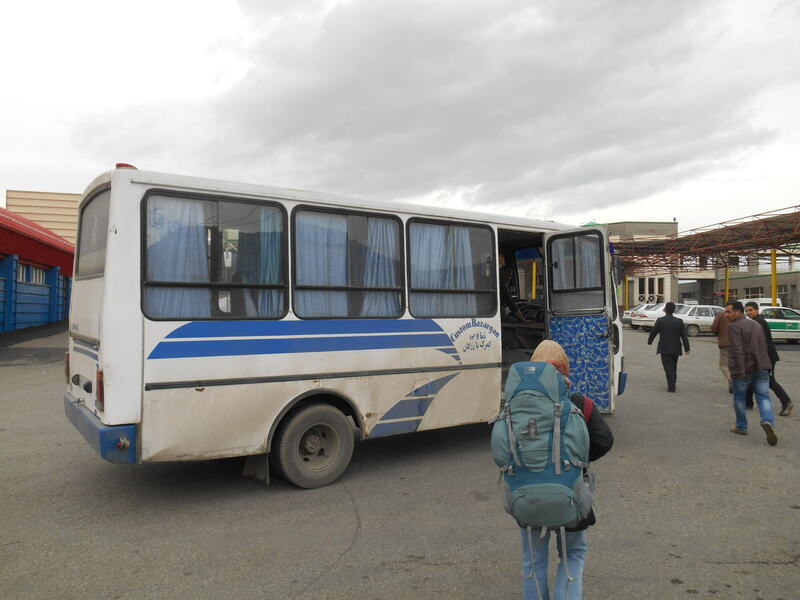 Get the mini-bus into Bazargan and then a taxi if you need to. 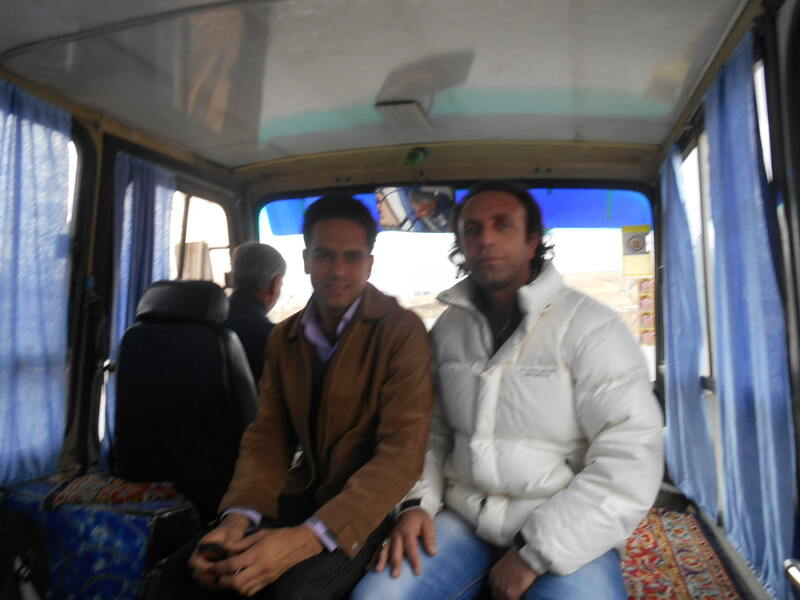 These two cool guys paid for our minibus into Bazargan. Move your watch forward one hour thirty minutes when you arrive in Iran. It’s a vast country as you’ll discover – we used 29 days of our 30 day visa and saw a hell of a lot of it – if you have the time – please linger longer – you will LOVE Iran. One thing to note is that there is no bag search on either side. I don’t recommend bringing alcohol into Iran, as I respect their culture, but for sure it’s something you could do without anyone finding out. 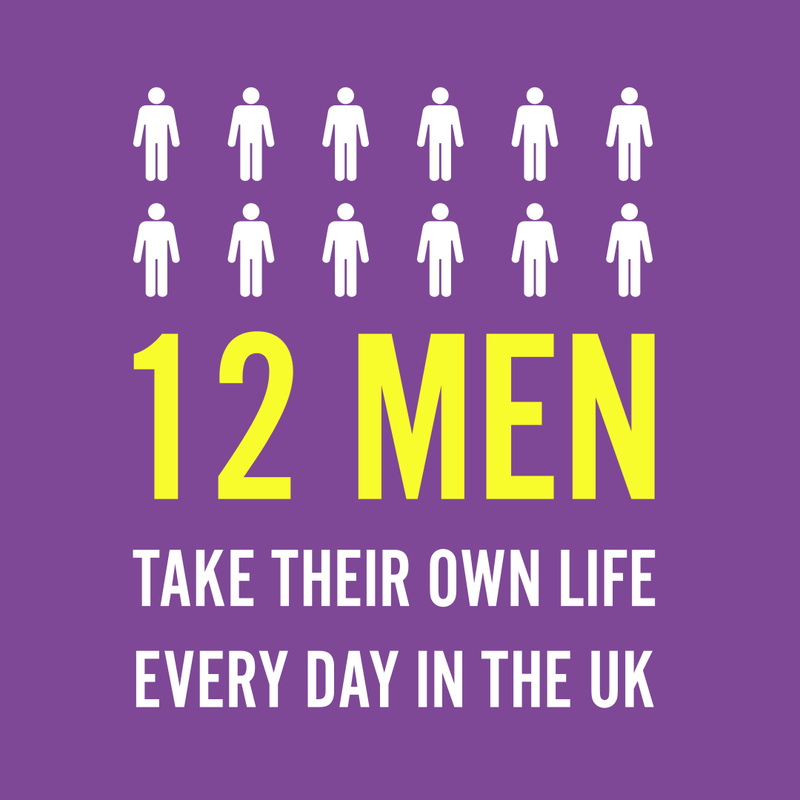 Please note – I don’t recommend this, unlike in Brunei where I signed a declaration and brought my own alcohol in. 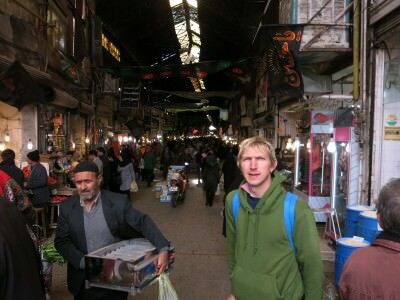 Loving our month in Iran: Qazvin Bazaar. You’re now in Iran folks – enjoy!! This entry was posted in Bazargan, Central Asia/Middle East, Destinations, Dogubayazit, Gurbulak, Iran, Turkey, World Borders. Bookmark the permalink. Hi Jonny, I’m quite surprised how straight forward this was. I hope you had a great time in Iran! Where are you these days? Where did you change money once you got to Bazargan? I’ll be doing this journey in a week’s time. 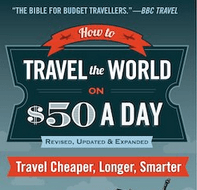 Need advice on changing money at border or in town. Thanks. Great pics et al. I am wondering if theres a direct bus from trabzon to dogubayazit? If so, what is the name of the company, as I cant seem to find it online. It would be great if u can tell me soon as I am leaving tmr for trabzon! That’s wonderful how you get to iran safely! Is there any mini-bus from Dugobaizit to main city Agri?? Can you also cross the border between Turkey and the Iran by car? That would also be an interesting experience.